Sleepy Hollow caravan park truly is one of Port Elizabeth's best kept secrets. It is situated in the Maitland River Valley and is a real get back to nature spot. That is if some idiot doesn't play his music loud enough for the whole camp to hear. But them you occasionally find in all camping areas. Sleepy Hollow has various short hiking trails with the main one following the Maitland River up the valley. Along the way are a few swimming holes and river crossings while a small waterfall can be accessed by boulder hopping up a separate gorge. 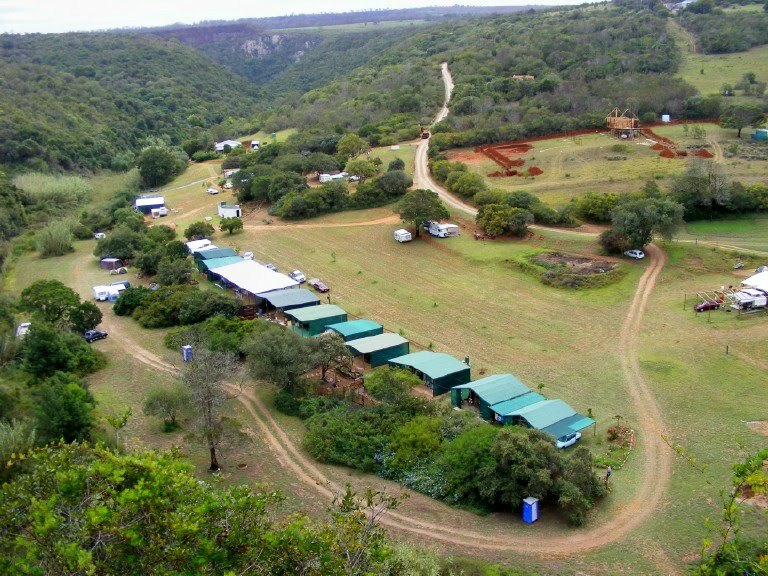 On the photo the camping areas are on the left next to the river or on the right above the ablutions. The row of roofs are caravans that are parked there permanently and who's owners come to Sleepy Hollow at least every second weekend. I remember crossing the Maitland River. Every caravan park I stayed at was very nice and clean. A lot of people there set up elaborate camps with their trailers. Thanks for the relaxing week at the camp site. My compliments to Betty which keeps the place always clean & tidy. The bathrooms where clean and hyjenic and there was always hot water available.For nature lovers, the hiking trails are exellent and managable also for alderly people. Keep up the good work see you again. I would like to know the cost for two adults (pensioners) to stay for a week, Saturday till the the next Saturday and where can i make the resevation for the week as well as the payment for the stay. Please email me at kobus.debruin@gmail.com with the information. Thanks. Call Anton Botha (Sleepy Hollow) at 084 675 1348 for more information.